Please be kind. Love one another. And have fun! Guardian Games does not and shall not discriminate on the basis of race, color, religion (creed), gender, gender expression, age, national origin (ancestry), disability, marital status, sexual orientation, or military status, in any of its activities or operations. These activities include, but are not limited to, hiring and firing of staff, selection of volunteers and vendors, and provision of services. We are committed to providing an inclusive and welcoming environment for all members of our gaming community, customers, staff, clients, & volunteers. Deviation from this policy and those following will not be tolerated. Please be kind. Love one another. And have fun! Minors allowed every day of the month, except on Pizza Night. Bottled and canned beverages are sold from the coolers in the general gaming area. Bottled and on-tap alcoholic beverages are sold in the Critical Sip room. Outside drinks are not allowed in the Critical Sip and Level Up areas of the store. Please do not consume beverages from containers that you did not obtain from Guardian Games. Such actions could jeopardize our OLCC Liquor License. If you do bring your own water bottle, or other beverage container, please leave it with the bartender while you are in the Critical Sip or Level Up. Personal water bottles are allowed in the general gaming area. We stock snack items for sale. Occasionally a food truck is parked in the parking lot. Outside food is allowed. All we ask is that you be considerate of other patrons and dispose of your trash in the containers provided. Please bring your own napkins, plates, etc. when possible. We support recycling and have appropriate recycling receptacles for bottles and cans. 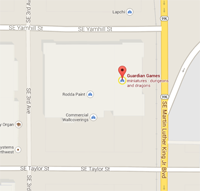 Please ask a Guardian Games staff member before removing or rearranging tables and chairs. Please abide by Oregon’s Indoor Clean Air Act: The Oregon Indoor Clean Air Act (ICAA), also known as the Smokefree WorkplaceLaw, prohibits smoking in the workplace and within 10 feet of all entrances, exits, accessibility ramps that lead to and from an entrance or exit, windows and air-intake vents. Area street parking: 2 hour limit, Monday-Friday 7 AM-6PM. No time limit on weekends. Any open and legal parking spot is available for parking. If you are attending an all-day weekend event @ GG, then please park across the street in the PLATT parking lot, or on the street. This leaves our parking lot available for drop-in customers.